If you’ve at least considered buying a home over the past four or five years, then it’s no longer news to you that the mortgage and refinancing industry are having a rough time at the moment. But just how tough? That’s a different question altogether and one to which there are numerous multi-faceted answers. However, one recent incident involving the former head of the U.S. central bank, Ben Bernanke, goes to show that the situation of the home buying process is getting out of hand and more absurd by the day. It seems that his former impressive position of power and status of employment hold no weight with the computerized systems which determine whether or not you’re worth your salt and deserving of a loan. In early October, Ben Bernanke made an appearance during a National Investment Center for Senior Housing and Care in Chicago. During a Q&A session with well-known economist Mark Zandi, Bernanke explained that he recently tried to refinance his mortgage, but to no avail. Naturally, the news was reported by all the major media outlets, such as Bloomberg News and CNN, especially since Bernanke rushed to add that he wasn’t “making that up”, over laughter from the audience. His remarks were also confirmed by Zandi, who explained that lending conditions for mortgage loans are now incredibly tight. The episode involving Bernanke basically just goes to confirm a reality most of the players on the market were already well aware of. Zandi also added that such tight mortgage lending and refinancing conditions are putting a damper on a genuine recovery of the housing market. Of course, the market didn’t benefit from the excessively relaxed conditions that caused the housing bubble either. 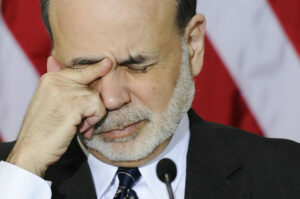 Yet, as Bernanke himself agreed, they may now have gone too far in the opposite direction. Nowadays, in order to get a mortgage loan approved or become eligible for the refinancing of such a loan, every applicant needs to pass through a computerized system, which all the major lenders employ. This software is approved by the major financial institutions, Fannie Mae and Freddie Mac, so that the banks can’t really be held accountable in case the approval system misfires. While this does create a cushy scenario for the lenders, it’s taking a major and unfair toll on the consumer. Unbeknownst to the powers that be, cases such as the former central banker’s occur every day. Since the loan applicants involved in them are not as high profile as Bernanke, their stories rarely ever make the news. Yet it’s interesting to note that Bernanke’s situation was not at all exceptional. What happened was that the lender asked him to provide documents, attesting to his sources of income over the past two years. Since he is no longer the chairman of the Federal Reserve and is mostly generating income from one-off speaking engagements, Bernanke might seem like he’s doing less and consequently making less money. In fact, the reality couldn’t be more different. Not only does he now have time to work on an upcoming print memoir, but he’s actually making more money than before. All of the above doesn’t mean you should just forget all about the steps to buying a home. If you’re set on buying or building your own house, there are plenty of solutions available to you out there. Predictably, they all come from smaller lenders, which have yet to adopt the money-grabbing attitude of their bigger counterparts. As such, freelancers, self-employed professionals, and just about anyone whose income stream might be considered a bit ‘unorthodox’ by major lender standards, is best advised to seek out a smaller institution. Try a community bank or a mortgage broker. You will save time, money and lots of headaches!